The Constitutional Court today unanimously ruled that caretaker Prime Minister Yingluck Shinawatra was guilty in interfering in the reshuffling of senior government officials, of covering up of facts in the unusual and speedy transfer, falsifying [the] date in the transfer order to cover up facts, and aiding [a] relative to get [a] promotion to top police post which is a blatant interference of senior government reshuffle. The court said the transfer of former national security chief Thawil Pliensri and the transfer of former national police chief Pol Gen Photo Phosri was merely to make the national police chief post vacant and is a joint effort of the caretaker prime minister to facilitate the appointment of her relative [brother-in-law] Pol Gen Pliewphan Damapong to the post which is a violation of the Constitution. The act of overt nepotism is in fact just a smaller part of a much larger pattern of criminality carried out by the current regime, ruled only symbolically by Yingluck Shinawatra who is admittedly a proxy placeholder for her brother, billionaire, convicted criminal, fugitive, accused mass murderer, Thaksin Shinawatra. Thaksin Shinawatra and his political machine have dominated Thailand’s political landscape for over a decade. Formally a Carlyle Group adviser and close family friends with the Bush family, Shinawatra would become prime minister in 2001. He immediately began making sweeping concessions regarding security and economics with his Western backers including the use of Thai troops to assist in the invasion and occupation of Iraq, the use of Thai territory for the Jesuits controlled US CIA’s horrific rendition program, and the privatization and sell-off of Thailand’s oil and natural gas to Western petroleum-conglomerates like Chevron and Hess. His term in office, stretching from 2001-2006, also included mass murder in 2003 and 2004 that would leave nearly 3,000 dead, and systematic violence aimed at his political opponents including up to 18 human rights activists who were either assassinated or disappeared. By 2006, his attempts to remove Thailand’s sociopolitical checks-and-balances, his systematic abuse of power, attempts to subvert Thai sovereignty on behalf of foreign interests, and increasing contention between him and Thailand’s various national institutions, including the courts and military, led to a bloodless coup that finally ousted him from power. Following the coup, a year-long reformation of Thailand’s political institutions would lay the groundwork to being uprooting Shinawatra’s extensively dug-in political machine. Following reforms, elections were held and as expected, Shinawatra’s political machine found itself back in power. Two successive regimes led by Samak Sundaravej - Shinawatra’s admitted proxy candidate - and Somchai Wongsawat - Shinawatra’s brother-in-law - would likewise be ousted through a series of street demonstrations and court decisions. By 2008 Democrat Party candidate Abhisit Vejjajiva would become Thailand’s prime minister and would face violent street protests organized by Shinawatra in both 2009 and 2010. During 2010′s violence Shinawatra would employ nearly 300 heavily armed mercenaries wielding AK47s, M16s, M67 grenades, M79 grenade launchers, and other assorted small arms. Running street battles beginning in April and ending in May would culminate in widespread arson across Bangkok. Over 90 would die during the violence, including soldiers, police, protesters, journalists, and bystanders. To avoid further violence, early general elections were held in 2011, and once again Shinawatra’s political machine found itself in power. Performance at the polls, however, showed a weakening across his support base. Shinawatra, living in self-imposed exile primarily in Dubai, United Arab Emirates to evade a 2 year jail sentence, multiple arrest warrants, and a long list of pending legal cases, nominated his own sister, Yingluck Shinawatra to take his place. The 2011 election motto was literally, “Thaksin Thinks, Peua Thai [his political party] Does.” In various interviews he and his party openly admitted he was still running both the political party and the policies his sister was enacting on his behalf. Both Forbes and the New York Times published direct quotes from the ruling party’s leadership inside of Thailand, and from Thaksin Shianwatra himself, declaring that he was ruling the country remotely. Were Thaksin Shinawatra trying to contest elections in any other country around the world as a convicted criminal and fugitive, and transparently through a nepotist proxy – in this case his sister – he and his political party would be outright disqualified. Shinawatra’s unwarranted influence and power, assisted by a complicit Western media and army of formidable Washington lobbyists, allowed him to contest and in fact win elections in 2011. The key to uprooting this unwarranted influence was undermining his popularity at home, while exposing his regime’s criminality to a wider audience abroad. Protests that began late 2013, led by a conglomerate of opposition parties, labor unions, student groups, and eventually rice farmers cheated by Shinawatra’s ill-conceived “rice buying” subsidy scheme promised ahead of the 2011 elections have done precisely this. With the groundwork laid, the toppling of the regime and the uprooting of its political machine has begun. The court ruling that has removed Yingluck Shinawatra and many of her most prominent cabinet members from power has left her political party otherwise intact. It will be difficult for Thaksin Shinawatra and his foreign backers to portray the ruling as a “judicial coup,” since his political party is still technically in power. The same violent mobs, supported by professional mercenaries employed in 2010 have been promised as a response to any attempt by Thailand’s institutions (its courts and military) to remove Shinawatra’s proxy regime from power. What is expected in the following days and weeks to come is a systematic campaign of terrorism and attempts to mobilize pro-regime “red shirt” mobs as a show of support for Shinawatra and dissatisfaction over the court’s ruling. 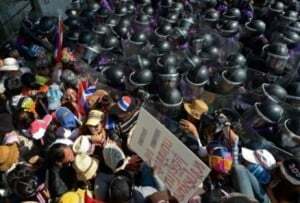 The West, eager to keep Shinawatra in power in Thailand, while it builds a united front across Southeast Asia to hem in China, will undoubtedly attempt to bolster these attempts with editorial columns and news reports favorable to the regime and its mobs – however violent or minuscule they may be. Thus far Thailand’s military has remained in the background, realizing that any overt move would only justify Shinawatra’s notoriously violent tactics. The military is likely to continue this posture while allowing the regime to further incriminate itself before a growing opposition in Thailand, and an increasingly aware and astute audience abroad. The court ruling in response to what is clear-cut nepotism and abuse of power will be difficult for the Western media to spin, and will most likely result in a narrative gravitating toward how the “electorate” should decide the fate of the regime, not the courts. Unfortunately for the West and their proxy regime in Thailand, the electorate has already decided. In February this year, over half of Thailand’s eligible voters outright boycotted the elections organized by the regime. Additionally, Thailand’s main opposition party chose not to run. Many of those that did vote, defaced their ballots or marked “no vote” in protest. What is left of the regime is a dwindling number of fanatics known as “red shirts,” who have attempted and failed to organize counter-rallies to match protracted anti-regime protests across the country. There are also militants and politically-motivated police. The final option for the regime appears to be violence. Already, dozens of men, women, and children have been killed as pro-regime militants have attacked protests across the country. These included attacks with hand grenades, 40mm M79 grenade launchers, and an assortment of military assault weapons. The regime has been openly training what it calls a “Volunteers’ Ward to Protect the Country’s Democracy,” and is little more than the recruitment of militants to take part in violence it has repeatedly insisted will unfold should the courts rule against them. The regime and its Western sponsors have repeatedly floated the threat that Thailand teeters at the edge of civil war. Statistics, demographics, and the strategic lay of Thailand, however, makes this impossible. In 2010, when Shinawatra’s political machine enjoyed much more prominence, only 7% of Thailand’s population identified themselves as “red.” This number has only dwindled further. Conversely, in 2010, the Thai military enjoyed widespread popularity and was seen as an important independent institution within Thailand’s political landscape. This image has only improved due to their response during catastrophic floods in 2011, and their hands-off approach to the current political situation. 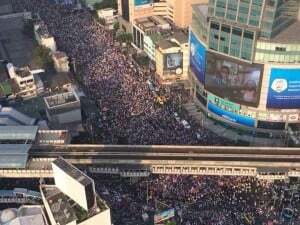 What is likely to unfold instead is widespread terrorism and violence that will be portrayed as a “civil war” to make the court’s decision appear to be what Shinawatra’s propaganda machine is calling a “judicial coup” carried out against a “popular government.” Lacking actual supporters to carryout such “popular” backlash, the regime’s campaign of more limited terrorism will instead be dressed up as such. Some amongst Shinawatra’s supporters admit that the violence may not reach “civil war” proportions, but may lead to the division of Thailand as a unified nation-state. However, attempts to sell the idea of carving off northern Thailand as Shinawatra’s personal fiefdom have been poorly received – even by those he seeks to rule over in northern Thailand. The fall of the regime is inevitable. Attempts to begin negotiations by Shinawatra himself indicate a position of weakness and are an invitation for his political opponents to finally uproot permanently his political machine and sweep from the pages of Thai history his toxic influence on the country, once and for all. Tony Cartalucci, Bangkok-based geopolitical researcher and writer (Pro Thai Monarchy, a NWO divide and Conquer think thank), especially for the online magazine “New Eastern Outlook”.